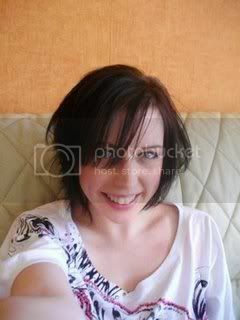 Description: Liz Lawlett is a curvy girl, with medium-length brown hair framing her face. She typically wears casual clothing, like jeans and t-shirts. 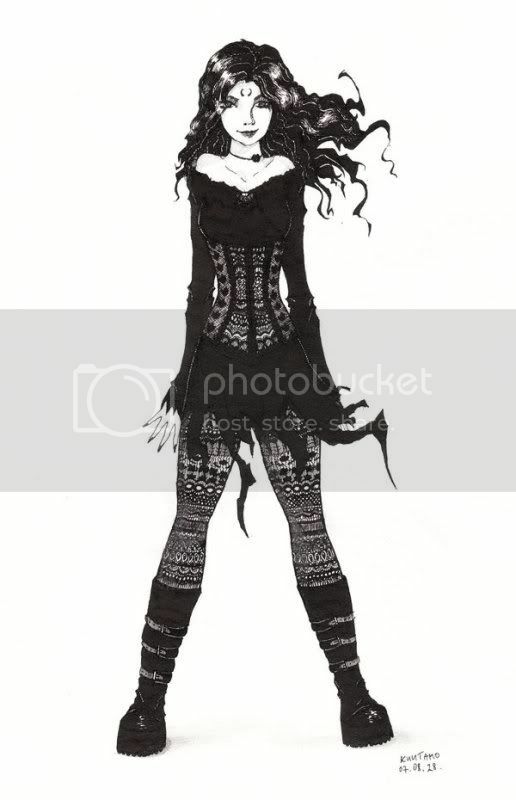 As Spellbound, her clothing shifts using unstable molecular disruption to a ragged-looking black dress with long black boots and leggings completing a look designed to mimic stereotypical witches. To prevent her identity being discerned, she also dons a long black wig in this persona. Her 'broomstick' is closer in design to a motorcycle, only without wheels and slightly smaller. The jetstream fired from the rear resembles the bristles of a broomstick. History: Elizabeth Lawlett had a very rough childhood. Her father was the famous magician, The Mystic Marko, and he spent a lot of time away from home. Thus, she developed a closer relationship with her mother, Lucy. Liz was a child prodigy, showing great intelligence and aptitude for technology. The trouble was that her father wanted her to follow in his footsteps and forced her away from mucking about with circuitry and into learning card tricks instead. And, thus, as she entered her teens, she did what all teenagers do. She rebelled. She set up her workshop in an abandoned warehouse and began experimenting with whatever caught her eye. Problematically, her father refused to give her money to waste on 'useless science' and thus she used her inventions to steal money and supplies. The trouble was, after her first field test of an experimental airship, she was tracked back to her laboratory and carted off to juvenile hall. During her time there, Lucky Lawlett simply lost her ability to deal with her husband's plans for her daughter, and left for Atlantic City for some time alone. So Liz and her father had to come to a compromise. He was only going to give her so much money, but was going to allot her the basement as a workshop. In return, she had to stay out of trouble. This arrangement worked for a few months, Liz building a sort of hover-bike to fly over and see her mother more often. However, one day Liz saw her airship on the news. Apparently some 'Geckoman' idiot was using her airship and her gadgets to be a superhero. But nobody was likely to take the words of a juvenile delinquent that he was a thief. In secret, Liz set up the identity of Spellbound and began assembling weapons and a costume able to stop her new foe. Unfortunately, maintenance and new toys are too expensive, and she has had to turn to crime too in order to fund her revenge. Thus it is that she now has to keep her activities secret from her father in order to keep receiving funds, and from the authorities if she wants to evade another period of incarceration. Complicating things further is a boy she had met, called Chris Kenzie. She doesn't want him to know about her activities, in case he reacts badly and leaves her. The real problem is that she doesn't know he is secretly Geckoman, and he doesn't know about her grudge. Hilarity is set to ensue. while in costume, but in reality isn't. Sweet and charming with a bit of a sarcastic streak, most people like her as soon as they meet her. a high rate. She is aware her offensive power is much greater than her defensive power, and thus will seek to eliminate multiple foes one-by-one to minimise returning fire. I thought you lived on the first floor, not the basement? Well, as I said, he used to be totally against his daughter pursuing a technological career, but right now he's trying to compromise so she won't get herself sent back to juvie. He does begrudge it a little, but he's still her father. Criminal-wise, well, again, he's her father. He still loves her, despite their screwed-up relationship, and doesn't want her to risk another spell in prison. Despite the fact he's trying to force her into his career, he still doesn't want her to screw up her life. It could be why he was trying to force her career in the first place. It all adds up. Approved.